Government PC buyers want custom configurations, but they 'can't pay an extra cent for the extras,' said Mike Wagner, vice president of desktop marketing for Toshiba America Information Systems Inc. So Toshiba and Compaq Computer Corp. have tailored their newest client PCs to government preferences. The entry-level $800 Toshiba Equium 8000S and $699 Compaq Deskpro EX, announced last week, differ by little more than a CD-ROM drive. Each has a 566-MHz Celeron processor, 64M of RAM, a 10/100-Mbps network card, a hard drive of 7.5G or more, built-in manageability software and Microsoft Windows 98. Windows 95 is an alternative choice until year's end, when Microsoft Corp. will stop supporting it. EX slims down with a $799, 15-inch LCD flat panel. 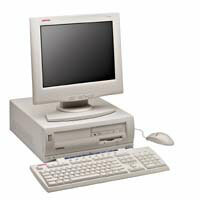 The Equium has a 24X CD-ROM drive; Deskpro does not. Neither comes with a monitor, but Compaq's 15-inch TFT5004 LCD flat panel is $799. Either client PC can be configured online to fit users' exact needs. Processors range up to the 1-GHz Pentium III, memory up to 256M, drives up to 20G and front-side buses to 133 MHz. CD-rewritable drives and Imation SuperDisk LS-120 drives from Imation Enterprises Corp. of Oakdale, Minn., are both popular add-ons, the vendors said. 'We all have bets as to when the floppy disk will finally disappear,' said Lisa Baker, director of Compaq's North American desktop marketing. Federal buyers increasingly seek minimalist PC proportions, according to the vendors. The 19-pound Equium has Toshiba's smallest desktop form factor, Wagner said. Its quiet fan, special venting and noise-dampening insulation keep the chassis cool while reducing noise to about 35 decibels. Compare that to the average PC's 50 decibels, he said. Compaq also is upgrading its Web ordering site for government buyers, who account for much of Compaq's online sales, Baker said. Compaq's new ordering site is not yet available; government buyers currently have a page at www6.compaq.com/govt. Toshiba's configurator is at www.toshibapc.com/systems20. In other PC news, Dell Computer Corp. this month will begin delivering one or two 1-GHz Pentium III or 1-GHz Xeon processors in its Precision WorkStation 220 and 240 models. The 1-GHz processors are not the same as the 1.13-GHz chips Intel Corp. has recalled for flaws (see related story). A Precision WorkStation 620 with 128M of RAM, a 9G SCSI drive, nVidia graphics, a 48X CD-ROM drive and Windows 2000 goes for $3,818.